New smart reusable cups and bottles, in a range of shades and pastel colours. Frank Green is a company with an environmental focus making reusable water bottles and coffee cups that incorporate smart technology and win design awards. Until now, the Melbourne-based company’s range of playful but stylish products extended to vessels made with a double-walled thermo-plastic. Today, Frank Green launches its stainless-steel SmartCup and SmartBottle. Suitable for both hot and cold liquids, the stainless-steel flasks are available in a 295-millilitre cup for $39.95 or a 595-millilitre bottle for $49.95. Both are vacuumed-insulated, double-walled and can maintain temperature for up to 12 hours. Thanks to their wide lids, you’ll have no trouble jam-packing your water with ice or fruit on warmer days, and come wintertime, the flasks become a sleek and stylish soup mug or thermos. The alloy vessels are slightly heavier than the plastic originals (which are made of Tritan, a BPA and toxin free polycarbonate) but are lighter than glass alternatives. 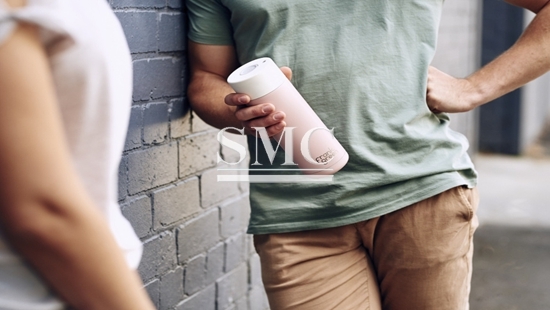 Aesthetically, the steel SmartCup and SmartBottle mirror Frank Green’s original range, with clean, curved lines and a minimalist but practical design. Inspired by Pantone’s palette-pick for 2018, the stainless-steel range is available in a variety of colours including gunmetal grey, peach and blue, among others, and mixes matte and metallic finishes. They’re as light as their plastic counterparts, and similarly durable. But if the time ever comes for an upgrade, they can be recycled in Australia without creating more landfill. The plastic lining in disposable paper coffee cups, on the other hand, takes 1000 years to break down in landfill, and most plastic bottles go straight into the rubbish bin, and therefore also landfill.